This rare Sumatran coffee is aged for 18 to 24 months in special storage warehouses in Sumatra. The result is a delightfully smooth Mandheling coffee, rich in flavour, very full-bodied, with excellent aroma, low acidity, and a long-lasting syrupy aftertaste. This aged Sumatra coffee has the lowest acidity of any coffee we offer. The island of Sumatra, the sixth largest in the world, is well suited for coffee. It is divided by the Barisan range of mountains that is 12,467 ft tall at its highest. 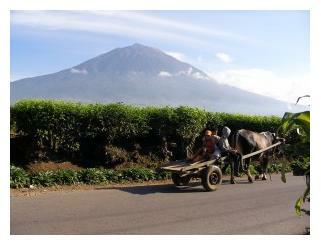 That peak is Mount Kerinci, an active volcano and located about the midpoint of the range. The arabica is grown at higher elevations than the robusta, and most of the growers are smallholders. Indonesia was planted with coffee as early as 1696 when the Dutch sent slips from Malabar in India. Success came with a second planting in 1699, and coffee spread to the other islands, including Sumatra. However, the first exports of coffee from this area did not ship until the early 19th century. As production grew, so did exports, and by 1840, they had exceeded 12 million pounds. Peak production (prior to the coffee rust which destroyed most of the Arabica coffee trees) reached 21 million pounds in 1860. By 1900, much of Arabica had been replaced by Robusta coffee trees, which were resistant to coffee rust. Sumatra currently has Indonesia’s highest production of coffee. Last year, Indonesia’s total exports topped 56 million pounds last year, with only 12% of that being Arabica. Mandheling Coffee – What’s in a Name? Robusta replaced almost all the Arabica on Java, so by the early 20th century, Sumatran coffee, which still had some Arabica production, had eclipsed Java’s in terms of reputation. In addition, "Mandheling" coffee was gaining a reputation as well. Interestingly, Mandheling does not refer to a name, but an ethnic group. How this Sumatran coffee got named for a group is not known for sure. Some have said it dates back to a Japanese soldier who started commercially importing coffee he had tasted during the Japanese occupation; the name of the coffee he sought was associated with the ethnicity of the coffee shop owner. But the name Mandheling or Mandhailing appears earlier than the 1950’s, so the story may be apocryphal. We have some more information about Sumatra in this newsletter. Our "Pawani Private Reserve" is aged for 18 to 24 months in special warehouses in Sumatra, as much of the Mandheling coffee was prior to the end of Dutch rule in 1908. The resulting cup has a rich earthy aroma with hints of cocoa. The coffee drinks very smooth and rich, round on the tongue and a hint of green. Our Sumatra Mandheling coffee has the lowest acidity of any of our coffees, and has been a perennial favorite of our customers.